In 1998 the Seward Co-op built a new store at 2111 East Franklin Avenue. The vacant Riverside Market building at 29th and Franklin was identified in 2006 as the new site for the expanding Co-op. In 2008 the Riverside Market building was renovated and an addition built on the western side. The former Franklin Co-op Creamery building before renovation by Seward Co-op (circa 2013). The renovated Creamery building houses the Co-op Creamery Café, deli and meat prep for both Seward Co-op grocery locations, and administrative offices on the upper level. Redesign provided project management services to the Co-op through the leasing, design and construction phases of renovating the Creamery building, including the addition of a new elevator core and entrance on Franklin Avenue. The Seward Community Co-op grocery store has been a fixture on Franklin Avenue since 1972. Redesign first assisted the Co-op in expanding in the building that is now Welna Hardware, then in 1998 in building a new store at 2111 East Franklin. By 2005, the Co-op had outgrown the store and was in dire need of a new home. Redesign acquired the vacant and abandoned former Riverside Market site at 2823 East Franklin Avenue and began work with the Co-op on redevelopment. Redesign followed an extensive community engagement process plan for redevelopment. A plan emerged that dedicated the entire site to Seward Co-op and included the acquisition of additional blighted property. The project doubled the size of the Co-op to over 25,000 square feet by re-using the existing building and constructing a 6,600 square foot addition and a 6,000 square foot second floor for offices and education. The project also included re-configuring alley access and a stormwater demonstration project with funding from the Mississippi Watershed Management Organization that included a stormwater catchment system and rain garden. The project is LEED Gold certified. A citizen-based committee of the Seward Neighborhood Group, the Riverside Market Task Force, worked with Redesign and the Co-op to determine a vision for the site. The expansion brought 50 new jobs to the community and has been a resounding success in offering local, organic, sustainably grown and fairly traded products to the neighborhood. Seward has a long history of supporting cooperative enterprises. The Franklin Creamery Building at 26th and Franklin is a historically important landmark for co-ops, local food, and the food networks they create. 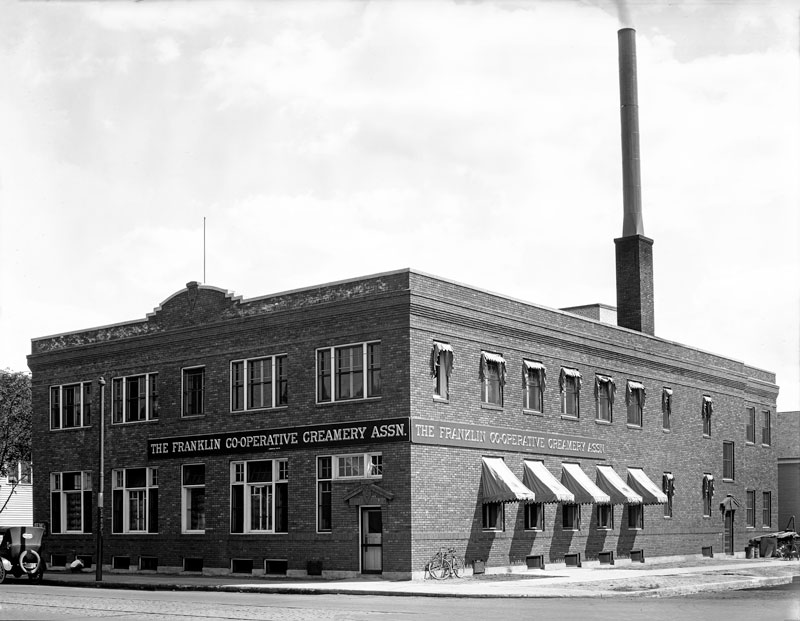 Built in the 1920s as a dairy production plant, the building was originally home to the Franklin Co-op Creamery Association, a milk and delivery co-op that produced 80 percent of the Twin Cities’ milk supply in its heyday. Original home of the Franklin Co-op Creamery Association at 2601 E. Franklin Avenue (circa 1920). In 2015, a longtime office tenant decided to move out of the building. The property had suffered from many years of disinvestment but the building owners were neither interested in investing further in the property or in selling. Redesign stepped in to recruit a user who would contribute to the street life of Franklin and also invest in renovation. Redesign was able to structure a transaction that provided a future option to acquire the property at a fixed price that would permit a tenant to justify the significant investment the property required. After some discussion, the Seward Coop decided that the building would meet their needs for a new commissary kitchen on the ground floor as well as their need for office space on the second floor. Redesign provided project management services to the Co-op through the leasing, design and construction phases, including a new elevator core and entrance on Franklin Avenue and a café to enliven the storefront. Redesign’s involvement in the project included brokerage services, design, permit and zoning technical assistance, and project management services. This project is an example of Redesign’s commitment to work to match buildings with businesses who are able to feasibly make needed investments, keeping the physical assets of our historic buildings active and in good shape for decades to come. Without Redesign’s involvement, this building would have continued to be non-handicapped accessible and closed to the public.